I love bread. I’d eat a loaf if I could. My fur-sister Suzie Q is the same. Dogs love bread but is it good for us? If your dog has eaten something sharp like a bone shard, feeding them bread can help. The bread will encase the sharp object & it will pass without harm. 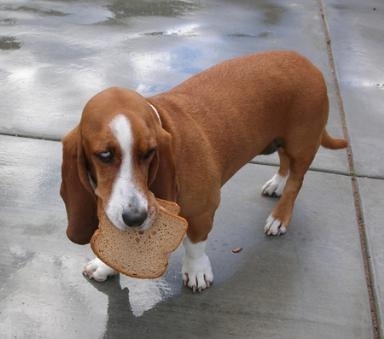 Bread can also help protect the esophagus from sharp bits if a dog eventually vomits or is given medicine to make him do so. Long pieces of string, yarn, thread, etc., are called “linear foreign bodies” by vets. Often, one end of a linear foreign body will becoming anchored somewhere along the intestinal tract. When this happens, the peristaltic action of the intestines cause them to move their way up the string. The intestines become pleated like an accordion, which prevents them from working normally. A meal of bread after ingesting a linear foreign body can help the material wad up into a clump & pass on through. Bread might also help a mildly upset tummy. However, if your dog vomits more than a couple of times, has diarrhea, is in pain, or is very lethargic you should get to a vet or animal emergency right away.